The 2018 BMW 330i is a sleek and alluring luxury sedan that can add impeccable style and biting performance to your trips throughout the Westchester County, White Plains, and New Rochelle area. If you’re in the market for a new luxury sedan, and you’re considering the 330i as a potential contender, let our team at BMW of Westchester provide you with the important details that can shed a little light on this stylish sedan and what it offers. From what you learn from this 2018 BMW 330i review, you’ll be able to tell right away if this sedan is the top choice for you. Keep reading to see what the BMW 330i luxury sedan offers and what it can do on the road! 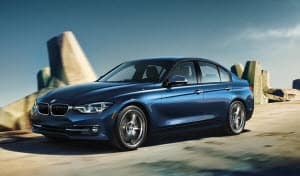 The BMW 330i is outfitted with the 2.0L BMW TwinPower Turbo engine that comes mated with the 8-speed Sport Automatic Transmission and can produce 248 horsepower and 258 lb-ft of torque. The vehicle features several drive modes to compensate for a variety of driving styles including Eco Pro, Comfort, Sport, and even Sport +. When the vehicle is pushed to its limits, it can reach a top speed of 130 MPH and hit 60 MPH from 0 in 5.9 seconds. The BMW 330i interior features a spacious and stylish cabin for its five passengers. Front passengers can spread out with the 41.3 inches of headroom and 42 inches of legroom. The seats are outfitted with SensaTec upholstery that complements the Fineline Anthracite Wood trim. As the driver, you can easily find your comfort with the 10-way power adjustable sport seat that allows you to adjust your seating comfort and lumbar support. The Driver Memory system will store your preferred seating and mirror positions for an easy re-adjust in case you swap driving duties. The cabin of the 2018 BMW 330i is outfitted with a strategically placed 9-speaker sound system that delivers hi-fi audio entertainment. You’ve got plenty of options from the HD Radio™, the CD/MP3 player, or your device that’s connected to the sound system through the USB port, or paired with the Bluetooth® hands-free system. The BMW 330i comes pre-wired for SiriusXM® Satellite Radio, so if you’ve got a subscription to this service, you can include it with your vehicle so you’ll ever miss your favorite satellite radio shows and stations. All your entertainment features and technology systems can be accessed with the iDrive 6.5-inch center touchscreen that features eight programmable memory buttons. Now that you’ve read our 2018 BMW 330i review, you’re a little more familiar with what this sedan offers with its performance, style, and features. However, you can benefit from learning even more about this stylish sedan to help you determine if it’s right for you. Why not experience this sedan through a fun and informative test drive, so you can be absolutely certain on how you feel? Schedule your test drive at BMW of Westchester. We’re proud to help drivers in Westchester County, White Plains, and New Rochelle make the decision that’s right for them when they’re choosing their next luxury car.